As with any medical condition a diagnosis should made done by a medical doctor. The notes here are purely for information to help determine if you MAY have Dupuytren’s, and to help you discuss your condition with your doctor. We strongly encourage you to discuss all health concerns with your GP. 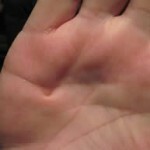 Dupuytren’s disease usually causes changes in the palm of the hand, in some cases it can affect the fingers. The most common changes are nodules, pitting and cords which can result in contracture. 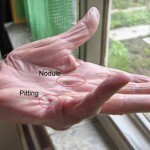 This picture shows a nodule, pitting and contracture. Dupuytren’s does not cause lumps on the back of the hand, except for lumps on the knuckles or finger joints which can be caused by the same type of tissue as nodules. These are called dorsal Dupuytren’s nodules or sometimes Garrod’s pads. For a description of some related conditions see our webpage on this. Sometimes the disease is painful, other people don’t experience pain. Many doctors think Dupuytren’s is by definition pain-free, but patients know better! Itching, burning or aching is also reported. 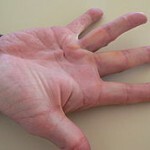 The first symptom of Dupuytren’s many times is a lump or nodule that may reach up to a centimetre across. It tends to start on the palm of the hand, usually in the area of the crease that forms when you bend your fingers. They most commonly present under the 4th and 5th finger (ringfinger and little finger). 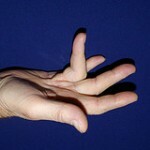 Nodules can also start in the fingers themselves or lower in the palm, but this is less common. Nodules in many cases look similar to and can sometimes be mistaken for calluses. Sometimes, there can be ‘pitting’ of the skin near the lumps. Pitting is literally small pits. They look as though the skin has been pulled into the palm of the hand (like the stitching on a leather sofa). Pitting usually occurs after nodules, but may appear on its own. It is thought to be a sign of a thin cord between the deeper fascia and the skin, that starts to contract. Cords are rope or string like structures that often follow the direction of the bones and the tendons, but are situated between the skin (sometimes attached to the skin) and the tendons and bones. They feel like hard sticks/needles just under on in the skin and try to pull the fingers to the palm of the hand when they start contracting. They run down the palm along the length of the finger tendons towards the base of the palm. They can also start in the finger and from there grow in the palm, or just stay in the finger. 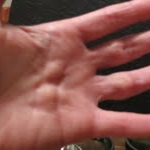 Cords can often be felt before they are visible, if you run your fingers over the palm of your hand and press lightly. Cords run from the nodules and may initially appear either near the base of the finger or in the middle of the palm, although they may go all the way from finger base to the base of the palm as they grow and extend. Cords from two different fingers may connect with each other in the palm of the hand. Cords usually appear to grow from nodules, but in some cases they seem to appear without a distinct nodule. After a while (normally months to years) the affected finger(s) may not straighten completely anymore (it becomes impossible to lay the hand flat on a table), and in the worst affected cases the finger(s) start to bend into the palm of the hand. In order to monitor how fast your Dupuytren’s is changing, there are a few simple ways to keep track. The Dupuytren Research Group have a webpage where you can log the amount of contracture in each finger, and by doing that regularly (eg every few months) you know if anything is changing (called ‘Predictomat’). Another way is by using white paper sheets and washable children’s paint, lightly cover your affected palm and the fingers of that hand and gently press on the paper, then let the impression dry. Keep the paper, do this every few months and you can tell if anything has changed. Lumps in the palm of the hand or foot, in the finger, or near other joints are not necessarily Dupuytren’s nodules, as there are other possible diagnoses. For example: ganglions, cysts, calluses, blisters, warts or other types of tumour. Lumps near or on a joint could also well be a mucoid cyst (also known as ganglion), which is a potentially painful cyst coming from a joint or tendon cover, filled with fluid. Contracting lumps or bands could be ‘cicatricial contraction’, which is hard contracted scar tissue usually in the skin, not under it. Swelling in the skin but not under it could be a callus or blister, which is an area of hardened and thickened skin, usually in reaction to repeated friction or pressure. Swollen and painful tendons deeper under the skin can be a sign of tendonitis, and sometimes the tendon can prolapse and appear close to the skin surface. Various types of benign or malignant tumours are also possible on the hands, feet and around joints. Once you have been diagnosed as having Dupuytren’s disease, do you need treatment? If it is not painful and not causing you any problems, we would advise to let your doctor monitor the situation and hold off on surgery. Treatment is not without risk of complications, and Dupuytren’s patients may tend to develop tight scars instead of healing nicely, so in some cases treatment, especially surgery can cause more problems than it cures if done too early. Many cases of Dupuytren’s disease either progress very slowly or not at all so that no treatment is needed. See this site for an excellent discussion. However if the lumps are painful, talk to your doctor. If you don’t have any pain, do the table-top test. Can you place the palm of your affected hand flat on a tabletop? If yes, you have are at Stage N or N1 of the disease and would not be considered for surgery at this stage. If there are signs that the disease is active as indicated by pain, soreness, physical changes, then Radiotherapy can slow the progression and reduce the chance of reaching stage 2, 3 or 4. Otherwise it’s probably best to just keep a close watch on it, perhaps a photographic record with updates monthly to see if there are any changes. If you can’t place the palm flat, and the affected fingers won’t straighten out completely, you have reached Stage N1 or 2 of the disease, and treatments to be considered are Needle Aponeurotomy or Collagenase Injections. If the finger is permanently bent towards the palm of the hand, you are at Stage 3 or 4 of the disease, you should consider whether you can benefit from surgical treatment.